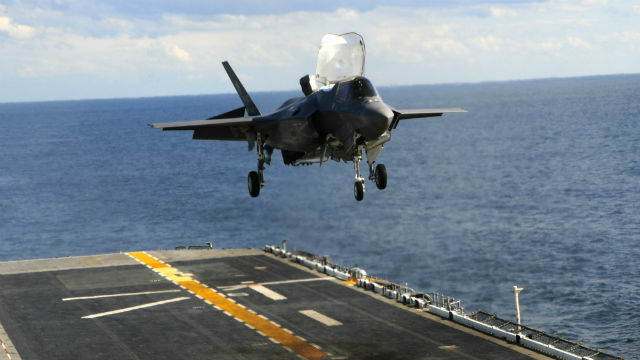 The Marines’ long-awaited F-35B Lightning II fighters, stealthy jets that can take off vertically from assault ships, are days away from being operational. The respected magazine Aviation Week & Space Technology said Marine Corps Commandant Joseph Dunford is expected to declare “initial operational capability” by the end of this month. The first operational squadron, Marine Fighter Attack Squadron 121, is based in Yuma. The F-35 Joint Strke Fighter is the most expensive weapons program in U.S. history, with a total of 2,500 aircraft planned in three versions. The Air Force version is expected to be operational next year, with the Navy version following two years later. Ten foreign countries have signed up to buy the fighter, including the United Kingdom, Italy, Australia, Canada, Norway, Denmark, the Netherlands and Turkey. The F-35 is a 5th Generation fighter, combining advanced stealth with fighter speed and agility and sophisticated sensors so that opponents can be defeated from miles away. It will replace the Marines’ F/A-18 Hornets and AV-8B Harriers. The new jet’s development has not been without controversy, with critics saying it is too complex and not sufficiently maneuverable in combat. However, manufacturer Lockheed Martin says the new aircraft regularly beats opponents in test flights and simulations.